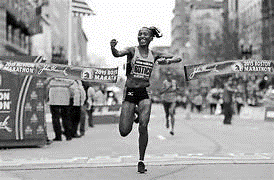 The Behavioral Science of Socks! No, this isn’t one of those government studies where you wonder how it ever got approved (i.e., how long can shrimp run on a treadmill or does playing FarmVille on Facebook help people to make friends and keep them?*). Socks and behavioral science. The two do not seem to fit together, yet I consistently use my socks as a personal behavioral modification tool. I have a penchant for different types of imaginative socks. It started 11 years ago, when one of our Au Pairs from Poland gave me a pair of very colorful, bright blue and green striped socks for Christmas. Before that, I was a bland brown and black sock kind of guy. But I liked wearing the colorful socks she gave me – I always seemed to smile when I put them on in the morning. As the years went by my colorful sock collection grew, both through my own purchases and through gifts from family and friends. As I collected more socks, they began to go beyond wild colors. They started to have pictures and statements – I had green socks with little footballs on them, red socks from Canada with drawings of little beavers on them. My kids even got me a pair of “I’m kind of a big Dill” socks with a picture of a large dill pickle on them. I often can’t distinguish my Thomas Jefferson socks with my “the Thinker” socks (that have an outline of the Rodin’s famous thinker) when they are folded up in my sock drawer. As my collection grew, there were three pairs that have led to my belief that something as simple as socks can be used as a powerful behavioral hack. The first are my Einstein socks. 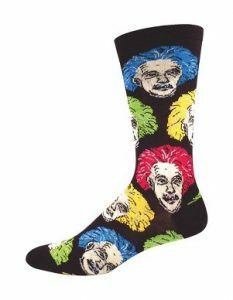 These black socks feature colorful caricatures of Einstein with wild colored hair. The second are my blue socks – punctuated by menacing sharks. 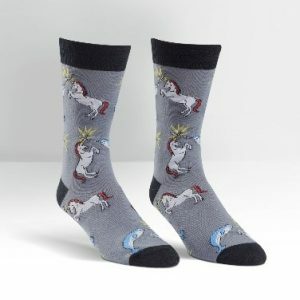 The final pair are my unicorn/ narwhal socks, emblazoned with unicorns battling narwhals horn-to-horn. I’m not sure when it started, but over time I realized that I was wearing each of these socks on specific days to help build and sustain a mindset for myself. 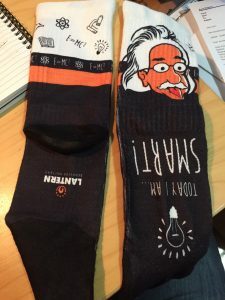 On days when I thought that I needed to be particularly smart, I would put on my Einstein socks. If I was giving a presentation, needing to do an analysis of research data or brainstorm ideas with a client, I would purposefully put these on in the morning. They framed the day, acting as a gentle reminder. Whenever I looked at them that I was smart and ready to refocus my energy. The shark socks were worn on days when I needed to be tough and direct. 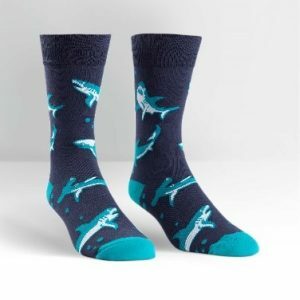 If I was working on a contract or in need of a tough conversation with a client or employee, I would pull out the shark socks. Finally, the unicorn/narwhal socks were used when I thought I needed a little bit of magic in my life. When I needed to feel lucky -the days I had a meeting with a new potential client or when I was flying. The interesting thing is that each day I wore the different socks, I had a different attitude., I exhibited different behaviors. I started to wonder: was this just me, or if was there something more to this? So, I looked for some research. Alas, there was no research on “socks’ impact on behavior” that I could find (if anybody knows of any, please let me know). However, there was plenty of research on the effects of attentional selection, pre-loaded associations, influence cues, and priming. These psychological components have been shown to influence our behaviors – often without us being aware of their influence. Robert Cialdini, one of the preeminent researchers on influence, says this in his book Pre-suasion, “…exposure either to simple words or simple images can have a pre-suasive impact on later actions that are merely associated with the words or images.” He uses an example where fundraisers who were raising funds for a local university were placed into one of two groups. Before their shift, each group was given a sheet of paper with information “designed to help them communicate the value of contributing to the cause.” The only difference was that one group received the information on a plain sheet of paper while the other group got the information on a piece of paper with a watermarked photo of a runner winning a race. We would think that this difference would have no or little impact on performance, the information is the same for both, yet those with the picture had 60% more donations than their non-picture counterparts. Another example, this one that shows how priming can influence behavior was done by Bargh, Chen, and Burrows (1996). In their study, Bargh et al., primed people with words that were related to being old. When they subsequently measured their walking speed, the people primed with old age words walked slower than those who had not. In essence, the socks I wear prime my behavior. Because I have a pre-association of Einstein with “smart” or sharks with “mean” – they have primed my mind to respond in this way. They also act as a vivid reminder of my intentions, refocusing my thoughts throughout the day whenever I catch sight of them. Now does this mean that I’m a completely different person when I wear different socks? No. I’m not a completely different person. My behavior is going to typically fluctuate around some behavioral norm that is my baseline. This norm is based on a number of factors that impact me including things such as the weather, how well I slept, what others in the room are doing, how I feel, etc. But at some level, the socks I choose are having an influence on me. They nudge me to behave in a manner based on the association that I have with them. It may be a slight change in my behavior, but that slight change could have large impacts on the overall outcome of my day. A word of caution, you better be careful if you are playing a game of trivial pursuit with me and I am wearing my new Einstein socks. You’ve been warned! Bargh JA, Chen M, Burrows L (1996) Automaticity of social behavior: direct effects of trait construct and stereotype-activation on action. Journal of Personality and Social Psychology 71: 230–244. Cialdini, R. B., (2016) Pre-fluence: a revolutionary way to influence and persuade. Simon & Shuster, New York, NY. Dijksterhuis, A., & Knippenberg, A.V. (1998). 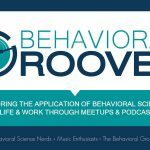 The relation between perception and behavior, or how to win a game of trivial pursuit. Journal of Personality and Social Psychology, 74(4), 865-877. *I think that these studies get a bad wrap because the researchers do a horrible job of explaining what their study is about. For instance, the shrimp treadmill study looked at how long shrimp would move on the treadmill in different water pollution conditions – trying to understand the impact that pollution had on their ability to flee predators and thus help predict how this would impact shrimp farmers in the future.